Polyvinyl butyral (PVB) is a specialty resin used primarily as a raw material for laminated safety glass sheet in automotive and architectural applications; these two applications account for 60% and 33%, respectively, of total consumption. 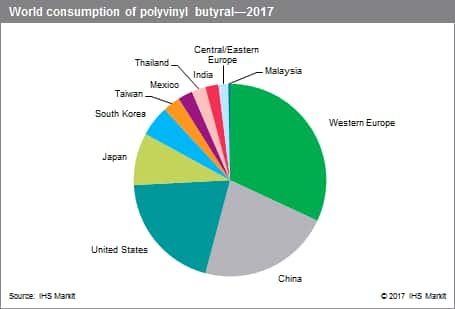 Global consumption of polyvinyl butyral has been growing faster than the general automotive and architectural markets. In automotive applications, laminated safety glass has been the de facto interlayer for windshields for many years, but is used increasingly to make side and roof glass on luxury cars to increase safety and reduce noise and light transfer. In architectural applications, laminated safety glass is used to satisfy regulations covering windows, as well as to promote energy savings and reduce noise. PVB is also used in solar panels as encapsulants, but this application remains fairly small. China and Europe account for the majority of growth. Laminated safety glass is widely used in the European architectural market, but to a lesser extent elsewhere in the world because of competing glass products. Automotive production continues to grow strongly in China. PVB is produced by a few companies that also usually produce PVB film and sheet. In addition to the major use as a precursor for the production of PVB-based film and sheets, PVB resins are consumed in wood coatings, wash primers, structural adhesives, inks/dry toners and as a binder for ceramics and composite fibers. However, this report focuses on PVB resins used to produce PVB film and sheet. The three multinational producers of PVB are Eastman Chemical (Solutia subsidiary), Kuraray, and Sekisui, which together account for over 60% of global capacity. Most of the remaining capacity is operated in China by domestic firms. All producers make film for the automotive and/or architectural markets. Sales in the primary end markets for polyvinyl butyral depend on the performance of the general economy, especially for safety glass in the automotive and architectural markets. The polyvinyl butyral film and sheet industry will expand into countries with expanding automotive production. In the most developed countries like the United States, Western Europe and Japan, but also in the Middle East, growth in demand for PVB film has been driven primarily by architectural laminated safety glass; the automotive glass market is mature in these countries. Production of PVB resin and film and sheet has grown rapidly in China. From 2011 to 2016, production of resin doubled, and film and sheet production more than doubled. After importing most of its film requirements in the early 2000s, China became a net exporter in 2016. Globally, the split of use of PVB sheet and film is about 55% automotive and 45% architectural. In Europe, the Middle East, and Africa, use in architectural applications is more important. Other PVB applications include use in solar panels as encapsulants. The top four film and sheet producers have developed film products for this application. However, the market is dominated by well-entrenched ethylene–vinyl acetate (EVA) films. The three multinational PVB producers have announced expansions of resin and/or film and sheet capacity, and capacity in China is expected to continue to grow. Global consumption of PVB is forecast to grow at an average annual rate of 4%.